What's the difference between a Kindle screen and an iPad screen? What’s the difference between a Kindle screen and an iPad screen? Why settle for a Kindle with a black-and-white display that turns pages at a snail’s pace, when you could snag an iPad with a color screen that lets you browse the web, watch movies, and read books? And what’s the difference between a Kindle screen and an iPad screen, anyway? Well, here’s the thing: the iPad’s LCD display is, indeed, perfect for watching videos, flicking through color photos, and even reading e-books and digital magazines—provided you’re indoors, with a power socket nearby. And while the Kindle’s screen can barely scroll through a web page, much less let you stream Netflix, it does a beautiful job of displaying text outside, even in direct sunlight. You’ll also be able to read for days or even weeks between charges. So, what’s the actual difference between the screens on the Kindle and such tablets as the iPad, the LCD-equipped Kindle Fire, and the new Nook Tablet? Allow me to explain—and don’t worry, I’ll try my best to keep it simple. Rather than going into the technical details on how an LCD screen works, suffice to say it consists of thousands or even millions of tiny dots, or pixels, that can change color dozens of times a second—fast enough to display a smooth video image, a scrolling web page, or an angry bird. The downside of LCD, though, is that all those vibrantly colorful, rapidly refreshing pixels aren’t terribly reflective, meaning that light (like sunlight) doesn’t bounce off of them all that well. For that reason, an LCD must be illuminated by a steady backlight, and that demands constant power—from, say, a wall outlet (in the case of the HDTV in your living room, or the PC on your desk) or a battery (for an iPad, an Android phone, or an iPod Touch). Indeed, one of the biggest reasons that your smartphone needs a charge every night is because of its power-hungry LCD. And while a backlit LCD screen is easy to read indoors, or in the dark, it pales the moment you step outside. Good luck reading an e-book on your iPad by the pool, under a clear blue sky. On the other hand, consider the black-and-white screen on a Kindle, or a similar e-reader like the original Barnes & Noble Nook or the Sony Reader. These e-reader devices don’t use LCD screens. Instead, they use a type of display that’s broadly described as e-paper. 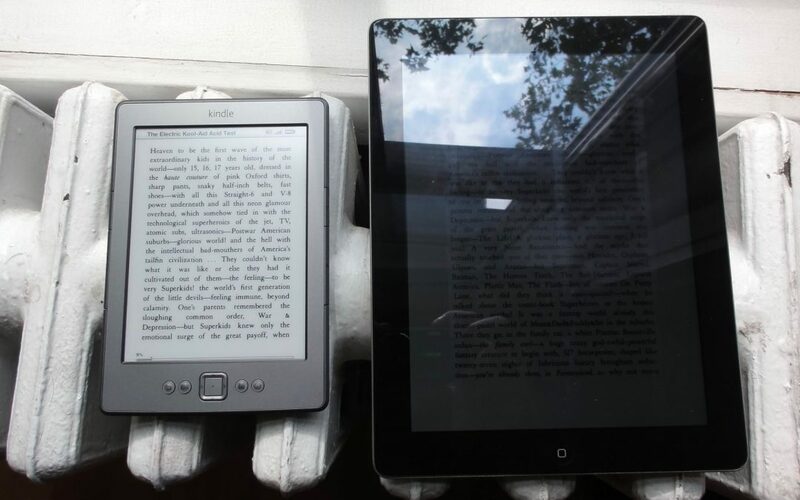 The Kindle and the Nook Touch use a particular type of e-paper display, made by a company called E Ink. Unlike LCD, these so-called “E Ink” displays don’t need a backlight—and in fact, an E Ink screen looks better and better the brighter it is outside. How does an E Ink screen work? Well, here’s one way of looking at it: a pool table covered by thousands of billiard balls, with each ball painted black on one side and white on the other. When the balls are turned in just the right way, you’ll see words or even pictures. Now, E Ink displays aren’t really made of thousands of tiny billiard balls; instead, we’re talking countless pixels with electrically-charged particles capable of displaying many shades of gray, not just black or white. But you get the idea. What’s the downside of an E Ink display? For one thing, its pixels “refresh” very slowly—just once every second or so, versus dozens of times a second for LCD pixels. In other words, there’s no way you’ll be watching YouTube on an E Ink screen. Also, while E Ink displays don’t need a backlight, they do need some ambient light to be visible at all. That means if you’re planning on reading your Kindle or Nook in a pitch-black room, you’d better bring a flashlight, too. And while there are color E Ink displays in development, they don’t offer nearly the same vibrancy as color LCD screens do (or at least, not yet). Devices like the iPad, an Android phone, the Amazon Fire, and other LCD-equipped gadgets can display just about anything, but they need lots of juice—and the darker the ambient lighting, the better their screens look. E-readers like the Kindle and the (old) Nook, however, display one thing—text—better than just about anything else, and they can do it without backlighting or constant power. One display isn’t better than the other, really; they just do different things in different ways.